10, or whatever, crimes that Aaron Hernandez did not commit because they did not happen if you know what’s good for you. 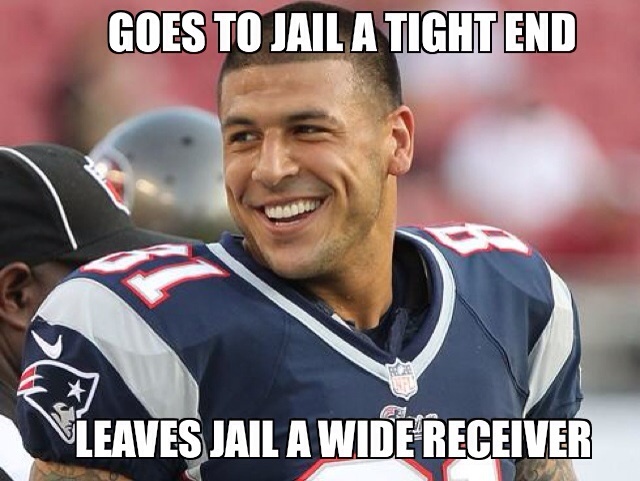 Only a short time ago it seemed that Aaron Hernandez had the World at his feet. What has come to light since is that this may have been because he had a gun trained on it. Any allegations are a long way from being proven despite compelling evidence from Hernandez’s home security cameras. Cameras which Hernandez staunchly denies having, in a video captured by his home security system. Nevertheless, whatever truths the law may establish, the following are situations that the wayward former sports star has not had any involvement in. Don’t you say that he did, for you will be bad … & wrong … & your pants will catch on fire. 1 ) Helping Guy Richie shoot Swept Away but not using a firearm to do it. 2 ) Playing a full NFL game using an actual pig instead of a football. 4 ) Swathing a duck in duct tape & persuading it to rob a convenience store. The duck refused to quack, took the wrap leaving police unable to prove any egging on was involved in hatching the plan. 7 ) Snatching a Faberge Egg and running 50 yards before stopping to hurl it to the ground & dancing in celebration. 14 ) Allegedly having connections to The Decepticons, The Anthill Mob, The Amoeba Boys, Gargamel and Team Rocket. 15 ) Being involved with stem cell treatments using flowers & operating as an unlicensed chiropractor.